As Wales commemorates 100 years since the start of the First World War, mobile communications technology is throwing new light on 100 war memorials across the country. QR (Quick Response) codes displayed near the memorials bring to visitors’ smartphones or tablets much more information than is displayed on the memorials – including individuals’ rank, regiment, date of death, age, burial place, next of kin and often the family’s local address. The facility is the result of a major collaboration between local historians, societies, museums, local authorities and others, facilitated by the HistoryPoints information project. Many people have contributed stories and photos for web pages in memory of relatives who died in service – pages which the public can view while standing by the relevant war memorial. One of the key aims is to make it easy for young people to discover how young men and women from their community – possibly their own street or school – made the ultimate sacrifice in the First and Second World Wars. The project also covers other conflicts from the Boer War to recent missions in Afghanistan and Iraq. For school groups, the facility brings an exciting new dimension to studying either of the world wars and understanding its local impact. All of the war memorial details can be browsed on the HistoryPoints.org website. With each memorial mapped, this could encourage some people to visit Welsh towns and villages to see their relative’s name on the memorial. Rhodri Clark, editor of HistoryPoints.org, said: “Some of the war memorials we’ve featured are normally hidden from public view, such as the Swansea Borough Police memorials inside the city’s central police station, but the QR codes provide access to the names and details around the clock. “A few of the memorials, such as at Risca, Newport and Conwy, have no names inscribed on them. The QR codes enable the public at those memorials to read the names of the local war dead on the spot for the first time. 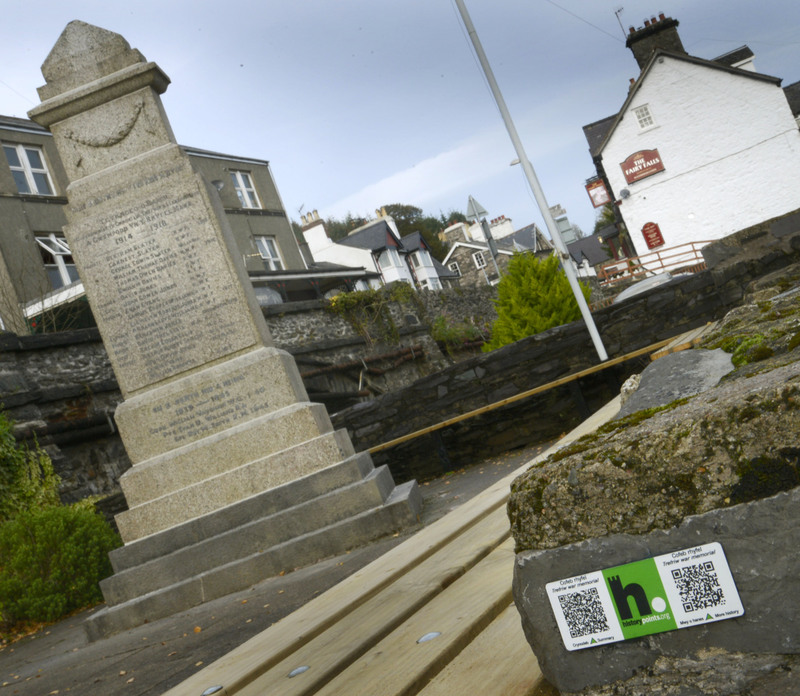 The HistoryPoints QR codes near the Welsh National War Memorial in Cardiff enable visitors to read a brief history of the monument and to select from a list of all the local war memorials featured in the project. People who visit the North Wales Heroes’ Memorial in Bangor are also invited to browse the list. The memorial at Cardiff Central railway station lists only the names of railmen who fell. Now the QR codes reveal their service details and, in many cases, their Great Western Railway jobs before enlisting. One web page is dedicated to the memory of three sons of the Lindsay family of Ystrad Mynach, who were killed within less than a year of each other during the First World War. As well as celebrating the heroism of decorated individuals, the project gives due credit to young men from ordinary civilian backgrounds who died as a result of service, whether in action, from illness or accidentally. One such individual was Frederick Rotchell, a gardener’s son from Wrexham, who drowned aged 19 in a Royal Navy accident in 1918. The brass nameplate from his “ditty box” was used by seabirds to line a nest. Relatives contributed his story and photos to the project. More than 900 places in Wales have received HistoryPoints QR codes. Other featured locations which help to provide local wartime context include war graves, sites where unusual events happened in wartime, and buildings where war heroes once lived or worked.